7041 Troll Battle Wheel is a Castle (2007) set released in 2008. 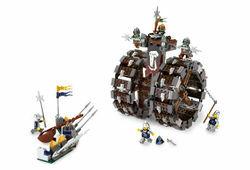 The set contains a troll battle wheel and six minifigures. The Battle Wheel is the main part of the set. This can be rolled back and forth using the handle on the back. There is a missile cannon embedded in the bas that can be fired from the back. If the set was real, it would be driven by the troll next to the top running and turning it in the process. Another Troll sits at the top of the tower and mans a crossbow. Next to him is a troll flag on a glaive. The Crown Knights have a small barricade with a catapult and six spears sticking out. The barricade also has a set of Crown Knight flags on a lance. Six minifigures are included in the set: a Troll Captain, two Troll Warriors, two Crown Soldiers and a Crown Archer. The set includes few weapons that are not on and of the models. 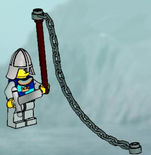 These include a troll sword, a glaive, two swords, a crown shield, and a chain and hook on a stick that can be used to climb onto the battle wheel. The 7041 Troll Battle Wheel is seen in the 2854298 LEGO: The Adventures of Clutch Powers. Facts about "7041 Troll Battle Wheel"